EnviroSafe gymnastics mats are safe for your gymnasts and the environment! Our gym mats are made with polyester fiber that is 100% recyclable, toxin-free, fire-retardant and mold and mildew proof. 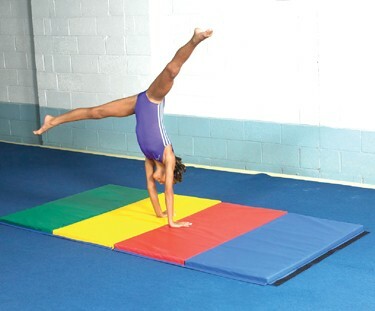 EnviroSafe gymnastics mats are safe for your gymnasts and the environment! Our gym mats are made with polyester fiber that is 100% recyclable, toxin-free, fire-retardant and mold and mildew proof. EnviroSafe gym floor mats are available in a variety of foam choices, sizes and color combinations. EnviroSafe has the appropriate mat for all skill levels - from beginners to advanced - and activities - low and high impact tumbling and landings. The foam choices range from very soft to extra firm to provide the right amount of cushioning and absorption required by your gymnasts. EnviroSafe gymnastics mats are perfect for your gymnastic club, school gymnasium or other athletic facility. They allow for easy handling and storage while not in use. Our exclusive EnviroSafe Gym mat and padding collection is made of a specialized foam product that is safe for your gymnasts, players and for the environment. Our wall padding line contributes to LEED credit score. If your construction project seeks LEED certification for green building, EnviroSafe wall padding can help fulfill checklist items and earn points. The LEED rating system was established by U.S. Green Building Council (USGBC) to promote buildings that are environmentally responsible places to live and work. Nissen EnviroSafe mat and wall padding fabrics are tough! PVC-coated fabrics are super tear-resistant, antibacterial, phthalate-free and have high UV and flame resistance. They can take the most rugged indoor and outdoor wear. All indoor mats and wall pad coverings meet fire codes - including NFPA 701, CA Fire Marshal and UL 300. 18 oz./sq. yd. fabrics coated in one homogeneous layer of PVC and polyester.